Film Society programme for 13th December 1964. 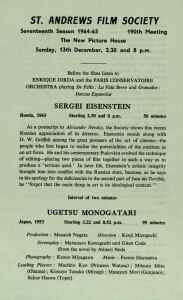 Showing Sergei Eisenstein (1963), a ‘Russian appreciation’. Emerging from the Dundee and St Andrews Film Society as a separate organisation in 1947, the St Andrews Film Society represented a shared pursuit for the ‘Town and Gown’ communities of an area so heavily influenced by its historic academic institution. The Society’s numbers steadily rose as the 1950s arrived, and this effective integration of local citizens and university students was noted at the Annual General Meeting in 1953, as they approximated that there were roughly two student members to every local. Over half a century before the establishment of a Film Studies Department at the University of St Andrews, the Film Society sought to educate its members on aspects of film form and directorial influence while broadening their horizons with a programme featuring an international array of films. As imports became more readily available following the war, films from continental Europe were a regular feature (with a noticeably fondness for French filmmakers). 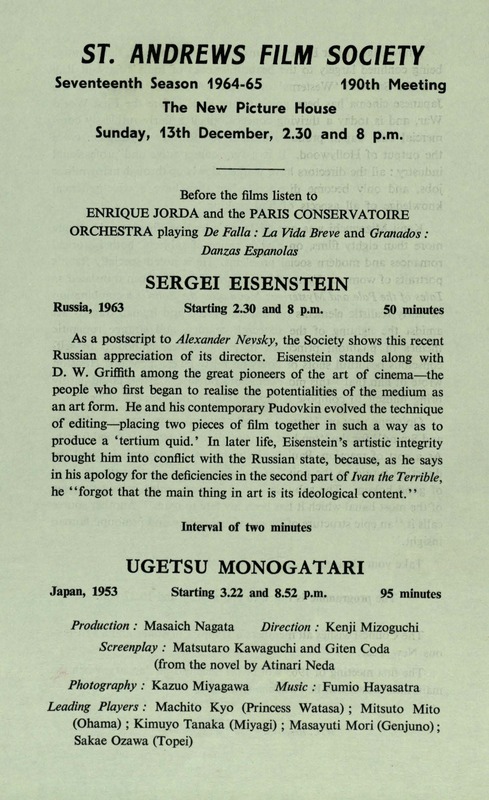 One filmmaker whose work also featured frequently at film society screenings up and down the country was Sergei Eisenstein. The Riga-born Russian remains today a canonical name in the syllabuses of film courses worldwide (including those at the University of St Andrews), and his 1925 classic Battleship Potemkin remains one of the most screened and studied films in film groups and academic institutions. Utilising the academic setting and mode of address, St Andrews Film Society made a significant attempt to edify their members with the work of Eisenstein in February 1953 when they invited “personal friend and biography author” Miss Marie Seton to present a special lecture. Having developed a close association with Eisenstein, which informed her much-lauded biography of him, Seton’s return to Britain saw her closely involved with the British Film Institute and the Film Society Movement. Her lecture was held on February 17th in School III of United College, and Miss Seton is believed to have delivered it with the aid of film strips of his work and a film screening lasting approximately one hour. The following week, the St Andrews Citizen reported that Seton’s lecture was attended by approximately fifty society members. Three months after the visit of Marie Seton to St Andrews, the paper published details of the Film Society’s Annual General Meeting, which cast this Eisenstein lecture in a rather less optimistic light. Despite a confident declaration that the society remained “one of the largest and most flourishing in Scotland”, the event appeared among a list of perceived failures for them, which also included their short-lived efforts to run a separate 16mm film society and continued attempts to finish production of an unspecified ‘St Andrews Film Unit’ film of their own. Having cost the society £15 (a considerable sum at the time) and reportedly attracted fewer than the fifty attendees mentioned previously, the council raised serious doubts about the feasibility of future events in a similar vein. While its facilities were evidently available for use by the Society, the University of St Andrews does not appear to have provided any fiscal backing to the organisation. With a limited budget to work with (despite high membership figures), it would seem that they were quite understandably reluctant to sacrifice financial stability for events that garnered only moderate support. ‘Pioneer Remembered‘, The Hindu (4 March 2010). Seton, M., Sergei M. Eisenstein: The Definitive Biography. New York: Grove Press, 1960. St Andrews Citizen (14 February 1953): 4. St Andrews Citizen (30 May 1953): 4.